Great competitive intelligence gathering will generate a lot of quality information. But the question is, what do you do with the competitive intelligence you gather? I use the example of Cheerios. If you’re buying Cheerios, it’s because you believe that there’s something compelling about this particular cereal. But if you’re a buyer of ‘oat cereal’ (they look the same), you’re buying based on price. So the question is, how do organizations become Cheerios rather than just oat cereal? Competitive intelligence gives you the tools –- translating it to competitive advantage is the critical next step. In a future post I’ll talk about using Blue Ocean strategy to create the holy grail of ‘uncontested market space’ (see W. Chan Kim & Renee Mauburgne, Blue Ocean Strategy). Briefly, the authors suggest that by evaluating key ‘competitive factors,’ organizations can plot out how their competitors invest in those competitive factors –- and how you (the seeker of the Blue Ocean) can redefine a strategy canvas by rethinking how consumers are making decisions. It’s a great tool –- but a bit too complex for a short blog. But, there’s no reason to despair or to defer serious evaluation of how the great competitor information you’ve collected can be used to redefine the positioning of the organization. The table below (from SWOT Analysis II: Looking Inside For Strengths and Weaknesses, Harvard Business Review 2006) provides a leg up on the traditional ‘SWOT’ Analysis. The typical ‘SWOT’ assessment identifies the organization’s strengths and weaknesses –- but doesn’t assess those strengths or weaknesses versus the competition. In reality, a key failing. 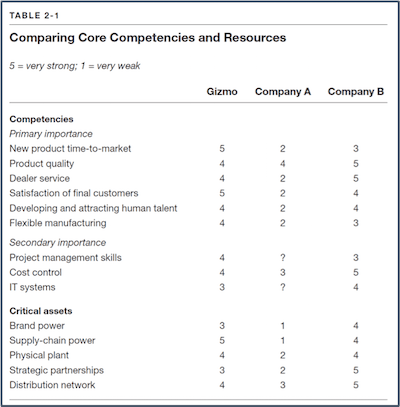 The above table demonstrates how the key competitors can be compared (in terms of strengths and weaknesses) using a set of criteria. More importantly, it suggests that the relative strengths and weaknesses be compared as well. Not only is it a fundamentally different approach to SWOT — but it begins to identify what your competitive advantage might be. Over time, presuming that the organization routinely conducts competitor intelligence, the more sophisticated Strength/Weakness assessment can be developed to reflect trends over time. In other words, if physical appearance, curb appeal, common areas, etc. have been a key strength for community A –- but a lack of reinvestment has now occurred for 3 to 5 years –- community B’s reinvestment could easily shift the table or the advantage. The trend over time assessment is depicted below. The final important ingredient though is to answer the question ‘who identifies the criteria?’ Typically the answer is senior leadership or the marketing staff –- after all, both should inherently know what’s critical. But sometimes that misses the fact that consumers are basing their buying decisions on different factors. The point is that the criteria can’t be developed in a vacuum – even a well informed vacuum. Rather, direct consumer input is critical. Combining the two, direct consumer input in determining the criteria and the scoring of competencies with a trajectory is a great way to enhance the typical SWOT discussion and gets the user a lot closer to truly understanding competitive advantage. So, how to develop that direct consumer input? Tune in to the webinar recording for some concrete answers! Scott Townsley is the Managing Principal of Trilogy Consulting, LLC and Professor of Practice at UMBC Aging in Catonsville, Maryland where he teaches Strategy, Entrepreneurship and Innovation. He has a BS in Business & Administration from Drexel University and a Juris Doctorate from Villanova University. His consulting practice focuses on market & consumer research as well as strategy. When he’s not researching or strategizing he’s a small boat sailor and runner. Scott Townsley is the Managing Principal of Trilogy Consulting, LLC (www.TrilogyConnect.com) and Professor of Practice at UMBC Aging in Catonsville, Maryland (http://erickson.umbc.edu/) where he teaches Strategy, Entrepreneurship and Innovation.He has a BS in Business & Administration from Drexel University and a Juris Doctorate from Villanova University.His consulting practice focuses on market & consumer research as well as strategy.When he’s not researching or strategizing he’s a small boat sailor and runner.